The St. Nicolae Church was established in the late 13th century in Gothic style and was rebuilt in the late 15th century to incorporate Baroque style of architecture. It is the first Orthodox church that was ever built in Transylvania region and along with the school that is located nearby, the church was once the backbone of Romanian culture and education. The exteriors of the church itself is quiet unique with a clock tower at its entrance but what truly makes it special are the interiors. The church has a number of frescoes and mural art created by the famous muralist MiÃÃˆ™u Popp. Walk in and you see a gorgeous play of colours, rich decorations that cover almost every inch of the church and beautiful chandeliers that caste a glow on the golden artwork! The main altar is breath-taking while the use of colour all around the ceiling and the wall, transports you into history! The church also has an adjacent graveyard where you can find notable politicians, poets and artists like Vasile Saftu, Dicolae Titulescu and Dr. Aurel Popovici, laid to rest. 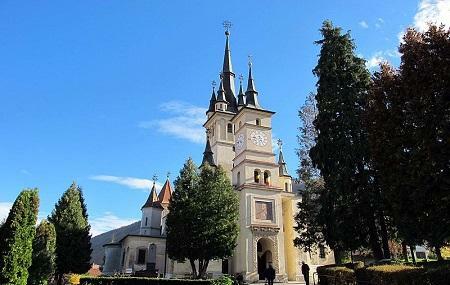 This is one of the most important landmark in Brasov as the city history is related very much with this church. Not only the church itself but the first school is to be visited if you are passing this area as well as the other buildings in the neighborhood. Beautiful church. Visit the First Romanian School Museum! A beautiful church in the Romanian quarter of the city. It's is wonderful condition. The grounds are very pretty and hold a monument and the grave of Nicolae Titulescu - a Romanian politician and at one time the president of the League of Nations. Nearby if the first Romanian school. Don't miss it! An old piece of romanian Christianity history, well preserved and cared. A beautiful orthodox church with astonishing Christians pictures on the inside. Also a Holly Mother picture that said it make miracles to those who are in true heart. In the cemetery near the church you can find Nicolae Titulescu's grave, who was a well respected romanian politician after the first world war. Also, near the church you can find the first romanian school, every artefact been placed in a beautiful Museum that you can visit. Access by car/ bus until United Nations Plaza and after that by foot, up the hill, for about 150m.